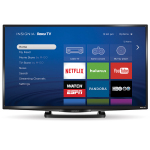 "Insignia is known for producing affordable, quality TVs that are available exclusively at Best Buy. With this partnership, we’re able to bring Roku TVs into even more homes across the U.S"
SARATOGA, Calif.--(BUSINESS WIRE)--Roku, Inc. today announced that Insignia Roku TV™ models will be available for purchase this month at Best Buy stores nationwide and at BestBuy.com. Announced at this year’s Consumer Electronics Show, Insignia Roku TV models will be available in 32” and 55” screen sizes. Insignia Roku TV models feature the award-winning Roku® operating system (Roku OS) and deliver a simple smart TV experience. In addition to a personalized home screen that enables quick, easy access to all TV entertainment sources, Insignia Roku TV models include access to more than 2,000 streaming channels. Roku TVs feature an easy to navigate, customizable home screen that places streaming channels alongside the customer’s favorite TV entertainment choices, such as game consoles, cable boxes and Blu-ray players. Unlike other smart TVs, consumers don’t have to switch between multiple inputs or navigate complicated menus to access their entertainment. With Roku TV, they can watch a live sports event, stream their favorite show or stream their favorite music all with a couple clicks of the remote. Roku TV provides access to the Roku Channel Store, which includes more available streaming channels than any other smart TV. Streaming channels available on the Roku platform feature movies and TV episodes plus live sports, music, news, fitness, and much more. In addition, Roku TVs feature Roku’s comprehensive and unbiased search to help consumers find availability and pricing for movies and TV shows across many top streaming channels. Search results are ordered with the cheapest (or free) results listed first. Consumers can also search for actors and directors and view filmographies. Roku TV models also include the Roku Feed, a new feature that updates consumers when entertainment they’re interested in becomes available to stream — and at what price. When browsing within Movies Coming Soon, consumers can “Follow” popular in-theater movies and receive automatic updates when relevant streaming information about the movie becomes available. Updates are provided when a movie is first released to streaming, becomes available from additional streaming channels or changes price. The 32” Insignia Roku TV will be available for $229.99 (MSRP). The 55” Insignia Roku TV will be available for $549.99 (MSRP). Both feature LED screens and 1080p Full HD, as well as 60Hz refresh rates. These will be available exclusively at Best Buy stores and BestBuy.com. Insignia Roku TVs will also be available at Best Buy stores in Canada and on BestBuy.ca. Visit BestBuy.ca for more information and pricing.